Brian Feldman needs between 9 and 18 volunteers to help him Saturday from 5 a.m. to midnight on his Tilikunundrum project. If you can help, call him at 407-792-9421 or email him at projects@brianfeldman.com. 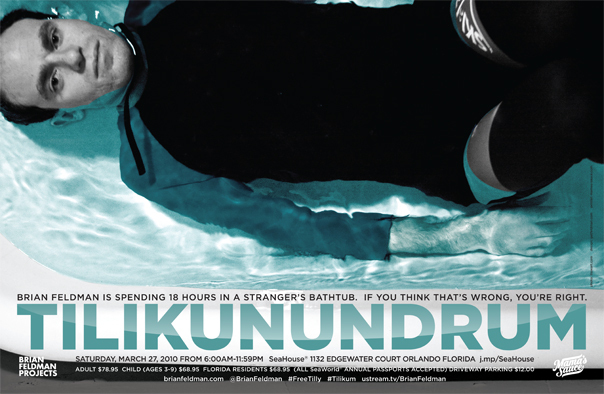 Brian Feldman is spending 18 hours in a stranger’s bathtub. If you think that’s wrong, you’re right. This is not on SeaWorld property. It is a private residence near Downtown Orlando. Tilikunundrum is an independent project and has not been authorized, sponsored, or otherwise approved by SeaWorld Parks & Entertainment or Ocean Futures Society. This entry was posted in Orlando theater, Performance art. Bookmark the permalink. See, I think “of comparative size” may be a bit of a stretch… I understand he’s in a tank and not free in the wide ocean, but to say that he’s trapped in a small space barely bigger than him in which he can’t even swim at all is a misnomer. At least I believe it is. If this whale is in fact trapped in a space that is as tight on him as a man in a bathtub, then please correct me. For a creature born to swim 100 miles a day, it is! And I’ve recently relocated to Washington State, where these wild whales are my state animal. They are known to swim from the US to Norway!